Last weekend, the New York Baby Show took place at Pier 94 on the West Side of Manhattan. It was my first time attending the show though I’ve known about it for a few years — friends have been going and telling me how amazing it was to interact with vendors, learn about new products and innovations, sit in on panels/discussions, and of course — most new moms or most anyone’s favorite thing — all the swag. Hubba Hubby and I managed to attend a few panels — the above photo was from the Pregnancy to New Parenthood panel early on the first day. They emphasized the importance of having a support network around you — other new moms preferably — and going outside, not shielding baby from the world. I thought they had a lot of good information and were very helpful. 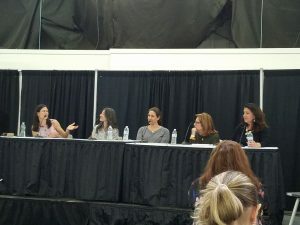 We also attended a more intimate seminar where I didn’t take photos (we were sitting almost front and center, I would have been in the panelists’ faces) that I thought was incredibly interesting — “New Dad Boot Camp” — which both Hubba Hubby and I felt helpful. A group of fathers run this group called the NYC Dads Group and offer 3 hour boot camp sessions for new dads to teach them basic skills for parenting — diapering, feeding, holding, burping, bathing, etc. They even have ‘veteran fathers’ come in with their babies so the new/soon-to-be dads can get hands-on experience with a real live baby! While there are lots of baby classes you can take with your partner that’ll teach you these things, I liked that it was geared specifically towards men, run by men, for men. I’ve noticed a trend where only motherhood is associated with parenthood and I find it inapplicable to my own life and family. Hubba Hubby has been extremely involved not just from conception, but every step of the way — pregnancy test, all of our OB appointments, going to the store repeatedly to register, … all of it. We both believe and want him to continue to be as involved even after birth, and I think this type of class will help give him (or any new dad!) the confidence to get right in there, get his hands dirty and change diapers, hold the baby, everything — both the fun and the not-so-fun. The other part of the NY Baby Show is walking around the venue, talking to vendors and learning about new/fun products. As an expecting-mother, I don’t have any baseline knowledge of kids products from past use. I had a lot of fun learning about a lot of products, but there were a number that caught my eye… my top 3 picks! 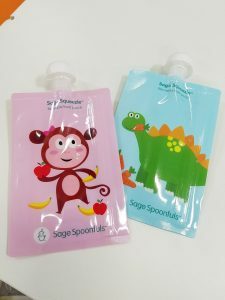 ABSOLUTE TOP PICK: Sage Spoonfuls offered a whole system for making your own baby food that wasn’t difficult or intensely involved — containers, a food processor, a cookbook (which I’m eyeing and may need to put on my registry! ), etc. — but the one piece that stuck out to me that I really liked? These “Sage Squeezie Food Pouches” (available in several different designs)! As someone who cooks frequently and enjoys it, my goal is to make my own baby food (I’m fully aware that this might not actually happen, but set goals and adapt them later!). I’ve seen tons of these pouches you can buy pre-filled for on-the-go snacking, but when I searched for empties to fill with my own homemade food, I came up woefully short — I could only find ones that filled from the top spout, which seemed messy and probably would take a while. These, however, seal up the side with a double-zipper (like any of those sealed sandwich bags) – you can stand them on their sides to fill up, then zip them up and boom! your own baby food pouch. They’re dishwasher safe (top rack only) up to 50x, and have a nifty little measurement on the back to help you keep track of how much baby is eating. Wait, you want to hear me describe this and show you the product? Oh, okay! MomTrends graciously hosted a blogger lounge – #MTBloggerLounge – that included a broadcast booth, so I took my best shot. Ahem. Yep, that’s how I speak. I’m a huge fan of OXO items as it is — then a few years ago, after they had roughly 50% of the people in their office with kids, they decided to launch their OXO Tots line, which includes containers sized appropriately for children (for storing your homemade baby food), bibs, sippy cups, all sorts of food-geared items. Imagine my surprise when I walked by the OXO booth and there were not just one but TWO strollers parked outside it. Ummm, what?? Hubba Hubby and I have had the most trouble picking out a stroller. He drives; I walk and train places. I’ll probably be with the baby more; he wants to push the stroller more when he’s with us. Lots of variables and everyone’s exact situation is so unique that it’s hard to get advice from people we know, too! So I asked the booth reps to show us the features of the Cubby+ (pictured above). Guys, if you’re at all familiar with OXO you already know that they have a solid lineup of products built around comfort and functionality, without losing the pleasing aesthetic. This stroller is no different, with a wide range of features, all of which you can read about on their site. The one major feature that I want to focus on is the collapsing part. Hubba Hubby and I are currently registered for one of the more expensive (upper-mid-level) strollers. Not the MOST expensive by any means (I had to talk him out of that one), but definitely a pricier stroller. We went to the store at least 3x to test strollers – pushing them around the store (did I mention that at the Baby Show, there was an obstacle course for people to test strollers?! ), putting on and releasing the brake, trying to maneuver it… and of course, collapsing them. Some people tell me I’ll never collapse it, other people say that they always collapse theirs, listen, every situation and family style is different. 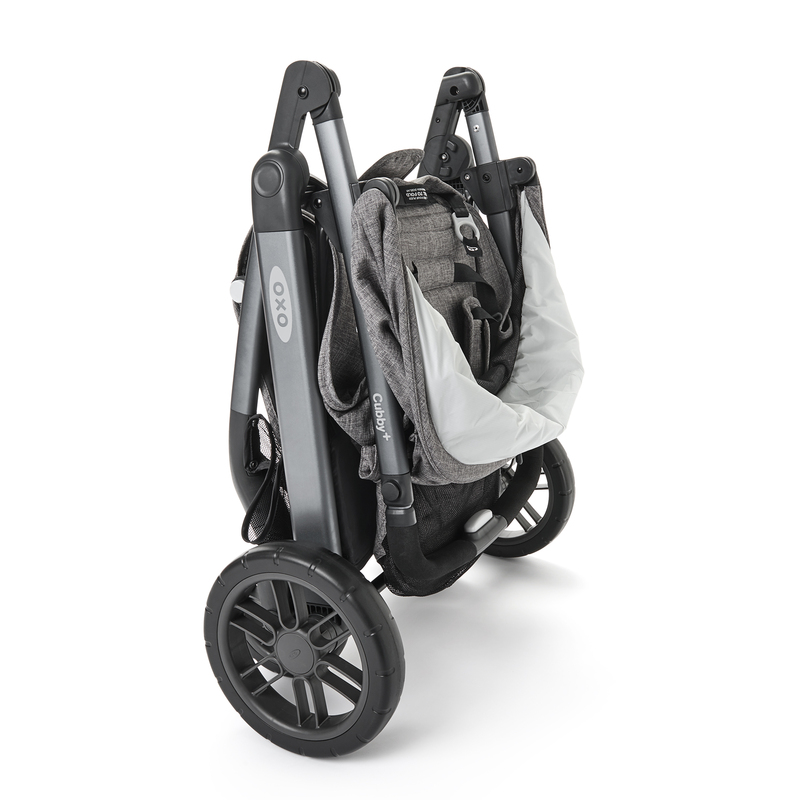 My biggest issue with every single stroller we saw in our desired ‘class’ of stroller: when you collapse it, the handles go on the ground. Like… ew. My hands go there! Then they’re supposed to touch the baby?! I’m telling you, this is a conspiracy with the baby wipe industry to make us use more wipes and antibacterial lotion. Take a look at the 2nd pic of the Cubby+. Notice something?? It’s collapsed by the handles aren’t touching the ground at all!!! BE STILL MY BEATING HEART. Also, it retails for only $399.99. This is, I believe, roughly $200 cheaper than the one we are currently registered for. 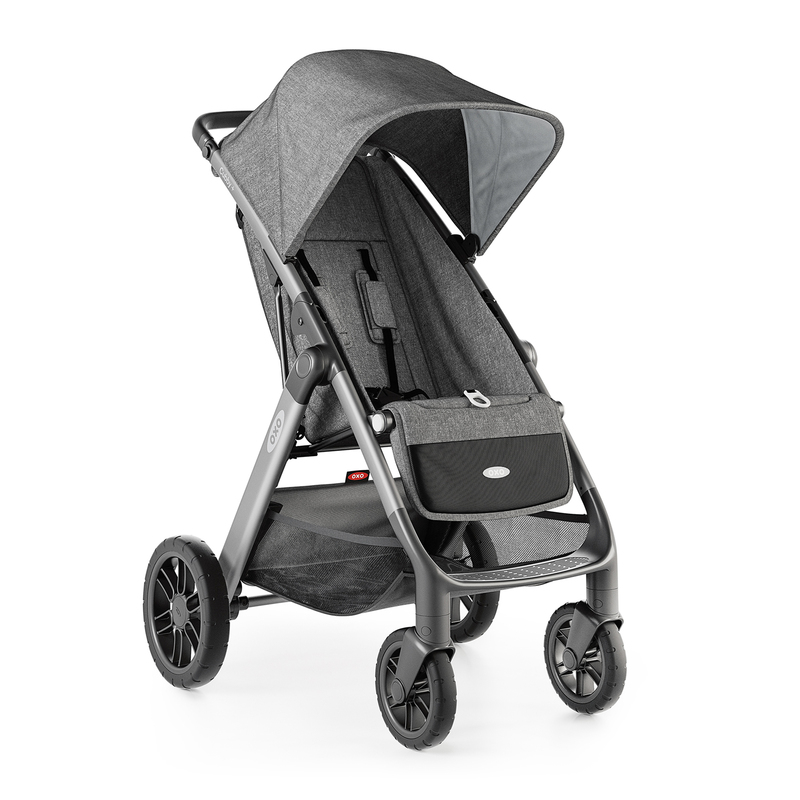 And the 20% off coupon at Buy Buy Baby works on this stroller (it doesn’t work on most strollers)!!! Guys that’s $320. That’s… ridiculous. Excuse me while I change our registry to this awesome stroller. Oh yeah, it collapses totally one-handed and unfolds completely one-handed too. No, seriously. It was amazing. Go read about the rest of its specs here. My 3rd top pick from the show isn’t as flashy and honestly there aren’t any pictures of it because it’s services for postpartum recovery: Apiari. I met briefly with one of the co-founders who was manning the booth, and she explained just how important the time directly after you give birth is. Bonding with baby, adapting your relationship with your partner to include this new little person in your life without excluding your partner, all of that — and how they provide a variety of services to help you with all of that. From postpartum doula (helping teach new parents how to care for their infant) to housekeeper and/or cleaner, all the way to something as simple as “family meals” (with choices of ‘fully cooked meals’, ‘in-home cooking kits’, or ‘ready to cook meals’)… you can basically describe where you’re having the most trouble and they will step in and relieve that stress and anxiety. Being a new parent is tough enough, everyone needs a little help sometimes. Phew — that was a lot!! After 2 intense days of talking to lots of vendors (most of whom had no idea I might write about them — I rarely identified myself as a blogger, once or twice AFTER I’d already asked my questions) — this is what we came home with. A massive pile of literature to sort through (with discounts! ), tons of swag — mostly very, very useful, and some of it completely useless (I’m looking at the pin! you can’t see it because it’s tucked under something, but I got a pin with a company name on it, which I feel a little bad just throwing away but…). 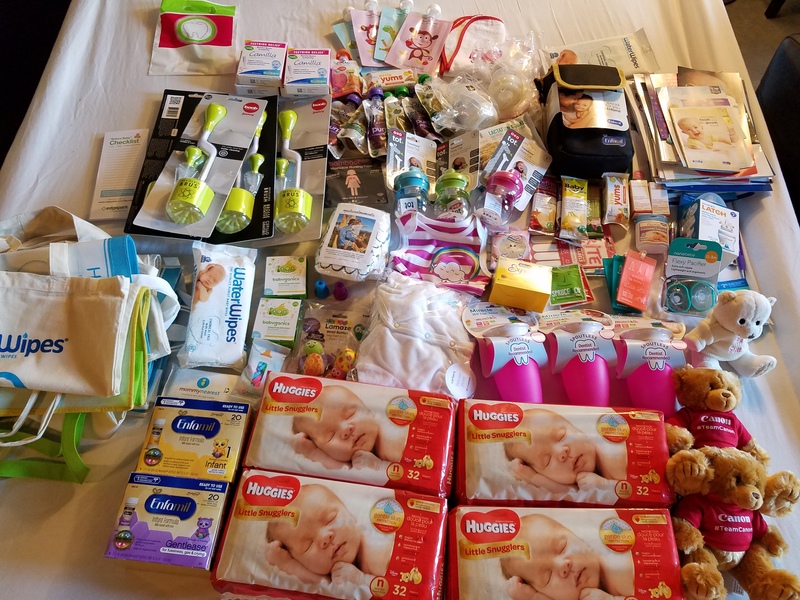 I am still in awe at all of this stuff and learning about so many new products that will help us start our journey with the new baby in August. Honestly, the New York Baby Show was an incredible and rewarding experience on so many levels. I highly recommend it to anyone who is expecting or plans to be expecting, or is close to someone expecting — and even those with small children already. There was tons of stuff to see, to do, to sample, even for those with little ones already — there were plenty of nursing areas, rest lounges, places to sit, play areas for the little ones — it was a very well-organized, thoughtful event designed for the entire family to enjoy. I had a great time and though I initially worried that Hubba Hubby would be bored, he wound up also having a great time and learning a lot about what to expect with our upcoming arrival. Now — my gift to you — all of the discount codes I picked up along the way from many of the vendors. Phew, that’s all of them!! Happy shopping and congratulations to all y’all who are expecting!!! **Amazon links are affiliate links. I was not compensated by any of the above vendors and opinions presented are my own alone.